I may have gone on a book binge while in the US and while contemplating which book I should read first, I remembered a review of STOLEN by Katy so I started it last night. It was hard to put down and I cannot wait to hop on the train to start it up again. I need to revise my story and find my groove again. I´m excited and scared at the same time. 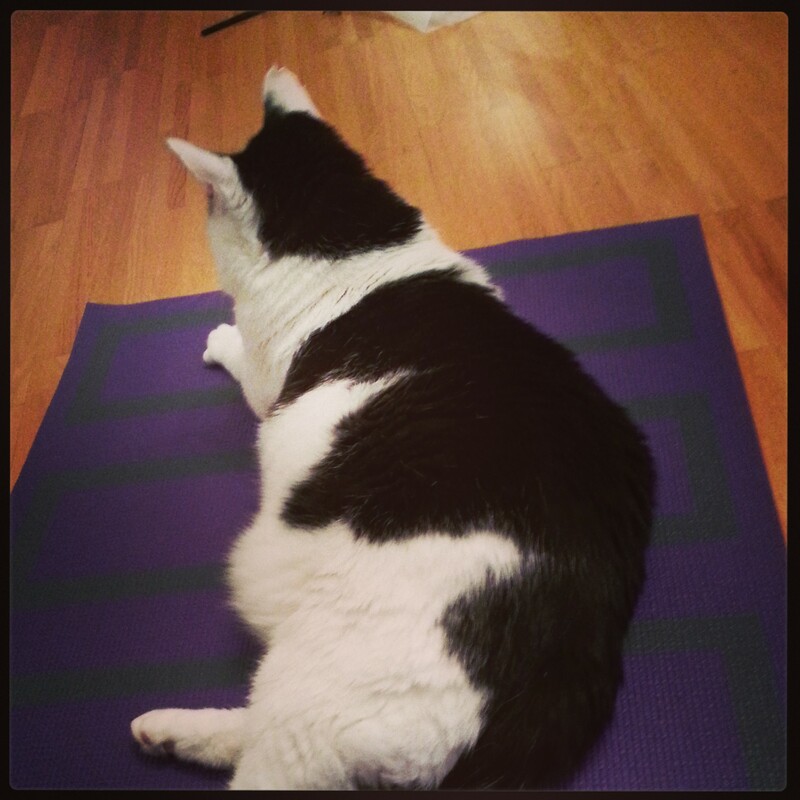 Well…if my cat lets me workout. My cat clearly didn’t want me to do crunches. Now that there’s going to be a Veronica Mars movie, I’m definitely going to have to watch the series too. Maybe I’ll even watch it on the treadmill. We’ll see how motivated I am. Hope you find your writing groove again soon! I think I watched 2 episodes of Veronica Mars, then got sidetracked by TVD and Nikita (my favorites). LOL your cat is so cute! STOLEN was definitely intense. The writing, the setting, the characters… 🙂 My cat knows he’s cute, he’s totally using it to his advantage. Or at least that’s what hubby and I think. Hope you had a great time at BEA! STOLEN has been on my perpetual TBR list since I read Katy’s review! This summer, I swear I’m going to finally read it. Also, I’m finally going to start watching Veronica Mars this summer (hello, reward for whenever I finally finish revising). I picked STOLEN up based on Katy’s review 🙂 And I don’t regret it. I’ll review the book soon but the writing really amazed me…the way the author manages to make me feel like I was in that desert with them. Amazing. Veronica Mars is a great incentive 🙂 Good luck on your revision! 🙂 Rebecca’s post was all kind of inspiring! Veronica Mars as incentive is working quite well for me and may I say I’m impressed by the Squat challenge! I don’t know that I would watch Veronica Mars, but it’s cool to see the German DVD! Do you watch it in German or English, or one with the other in subtitles? I *almost* got STOLEN from the library the other day, but I convinced myself to put it back since I already had a huge stack of books to check out! Yay for getting ready to revise–that’s my favourite part and always reminds me that no, I’m not a completely terrible writer and yes, writing can be fun 🙂 hope it does the same for you! I’m watching Veronica Mars for the first time – love it! 🙂 I haven’t read STOLEN but it sounds good, so I’ll have to check it out! Yay for STOLEN! If that book doesn’t give you a case of literary Stockhold Syndrom, I don’t know what will. Best of luck with your revisions, lady… You can do it! I did that last weekend. Watched Season 1 and Season 2 of Veronica Mars. I can’t wait for the movie. 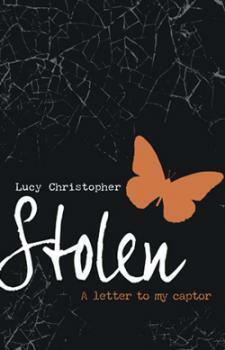 Stolen has a beautiful cover. Hope you enjoy it! STOLEN is SOOOO GOOD! Can’t wait to hear what you think. :0) And hooray for inspiration in all of its forms. I LOVE Veronica Mars. It is such a good show. I will have to check out Stolen. I’m always looking for a great read. Ohhh, I really enjoyed STOLEN when I read it last year!! I really hope you like it – can’t wait to hear what you think. Best of luck on getting back at those revisions! You can do it – it’s just a matter of jumping in! I’m off to check out Rebecca’s post – thanks for sharing! Stolen is fantastic, isn’t it? I’m one of those non-Veronica Mars watchers, too, but now with all the hype and the kickstarter, rectifying that is on my to-do list!